The ThINKin' Spot: You're Turtley Tubular! Good morning! Happy Friday to you, and welcome to The ThINKin' Spot! The weekend is almost upon us, and it's gonna be a good one! I'm optimistic that way. LOL!!! 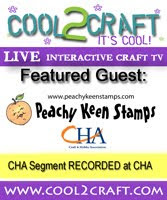 Today I have another card to share with you that I made using the new PKSC-06 and The Peachy Picks Kit from Peachy Keen Stamps. I did some paper piecing on the adorable turtle, and I added some lips with Copic markers. Stamping was all done with Memento tuxedo black ink, and coloring was done with Copics. Oh, and have you heard? They are having a surprise sale today!! Yep! You heard it right here, and HERE are ALL the details!! It's today ONLY, so don't miss your chance to stock up on some great sets from your wish list! It's our first FINALLY FRIDAY sale!! Enjoy FREE Shipping in the U.S. and Canada! NO CODE NEEDED - just shop & enjoy the savings! Garden Fairies, Turtles, Frogs, and FUN! Our JUNE release has everything you need to create your own Garden Party! Thanks for stopping by today! Have a glorious day, and an even more glorious weekend and Happy Stamping to ya!!!! Your coloring always blows me away! Love your card! Amazing job! OMG how cute is this card. Love your design and your coloring totally awesome. Have a Great Weekend Lorie. This adorable red-lipped turtle REALLY made me smile today, Lorie! She's so cute. Great job. OMG this red-lipped turtle is adorable! She really made me smile. Great job, Lorie. Cute card, cracking up at the lips. Adorable.